Sugar cookies are one of the undisputed champs of holiday baking. They’re a classic for a reason, lending themselves to sweet decorations and glitz. They are a humble cookie that dresses up well. Done right, they can be more than just edible platters for frosting. Plain sugar cookies can be crazy delicious—subtle like a short bread, but lighter. I was looking for a twist on sugar cookies that would bring the flavor without requiring someone (me) to stand around rolling out, cutting, and decorating. Making sugar cookies can be a day-long slog. By the time you decorate the last cookie, your fingers are tinted green and it looks like a steamrolled alligator. It was supposed to be a tree, but whatevs. I made two loaves of Sugar Cookie Bread. It turned out to be one of the favorite things I’ve ever baked. 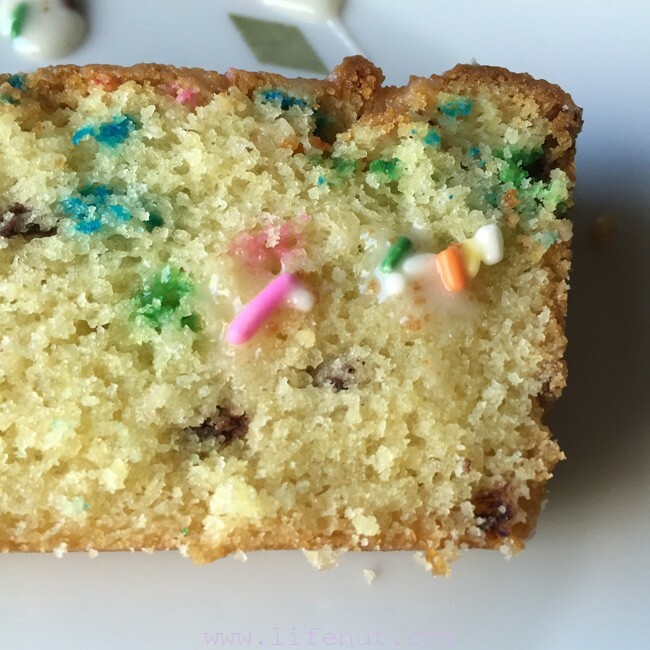 It is moist, sweet, buttery, fluffy and kind of adorable. Plus, it’s easy. I found a recipe at Tasty Kitchen, but disagree with aspects of it so I modified it. That’s why I’m sharing it here in my own words. Preheat the oven to 350 degrees. Grease and flour (or use flour cooking spray) two loaf pans. Mine are mismatched, so I used one 8.5 X 4.5 X 2.5 inch loaf pan and one 9 X 5 X 3 inch loaf pan. First, mix the dry ingredients in a medium bowl—the flour, baking powder, baking soda, and salt. I used a sifter to make sure all those white powdery bits were well mixed because there’s nothing worse than a mouthful of salt. Next, cream together the melted butter and sugar until fluffy. I used my hand mixer. No need to drag out the big guns with such a simple recipe. Add the eggs, one at a time, until blended. Then, add the extracts. Blend and add the milk and ounce or two at a time. The batter won’t be thick. Slowly add the dry ingredient mixture. I did this with a big spoon and it didn’t bust my arm off like some other batters and doughs. 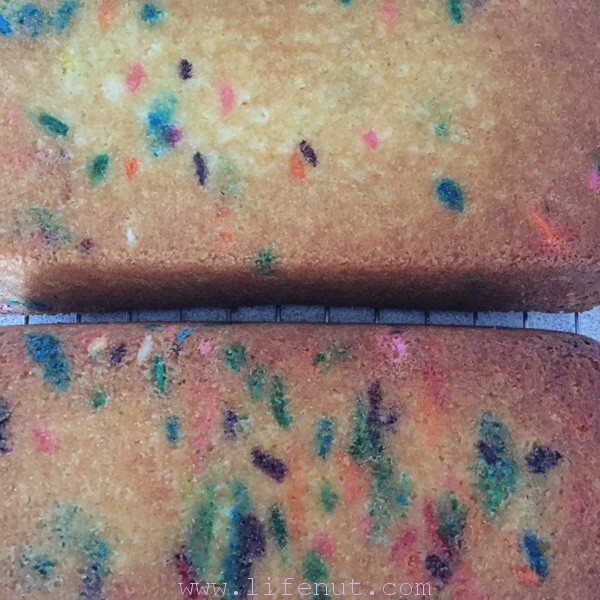 It ends up being like a very thick cake batter and not doughy. Last, but not least, gently fold in the sprinkles. I would NOT recommend using those shaped or harder sugar cake/cupcake decorative toppers (like snowflake, tree, candy cane shapes) because in the bread you don’t want to encounter anything crunchy (aside from a nice slightly crisp crust). Classic sprinkles soften unlike other types of cake decorative toppings. Sprinkles are your friend. Pour into prepared loaf pans. Despite my pans being different sizes, I poured about the same amount in each. Slide them into the oven. The original recipe said to bake for 50-60 minutes, until a toothpick comes out clean. I disagreed, so I set my timer for 45 minutes. At about 40 minutes, I peeked and discovered both loaves looked like they were done. I did the toothpick test on the loaf in the slightly larger pan it was done. I removed it from the oven and continued baking the other loaf until the time went off at 45 minutes. It was done. Later, when sliced, both loaves were perfect. I would begin to check you loaves around the 40 minute mark. If the loaves are pulled away from the pans and it’s golden brown, test with a toothpick. I can’t imagine the depressing sad-sack sugar bricks I would have baked if I had gone a full 60 minutes. Inedible! I cooled the loaves in the pans for the recommended 20 minutes, then popped them out to cool more on a rack. I let them continue to cool for several more hours. Now, for the glaze topping! I made the glaze recipe like it was published and found it really runny. I was afraid it would cascade off my loaves, so I ended up adding another 1/2 cup of powdered sugar. I poured it over the loaves and it still dripped down, but it hardened up after a few hours. Use sprinkles to enhance at will. A fun twist would be to use orange or peppermint extract in the glaze. The loaves are so buttery, they’d lend themselves to other flavors. I stuck with vanilla. Another fun option would be to make a classic sugar cookie frosting and use that on just the top of the loaves. I might try that the next time I make this and there will be a next time. 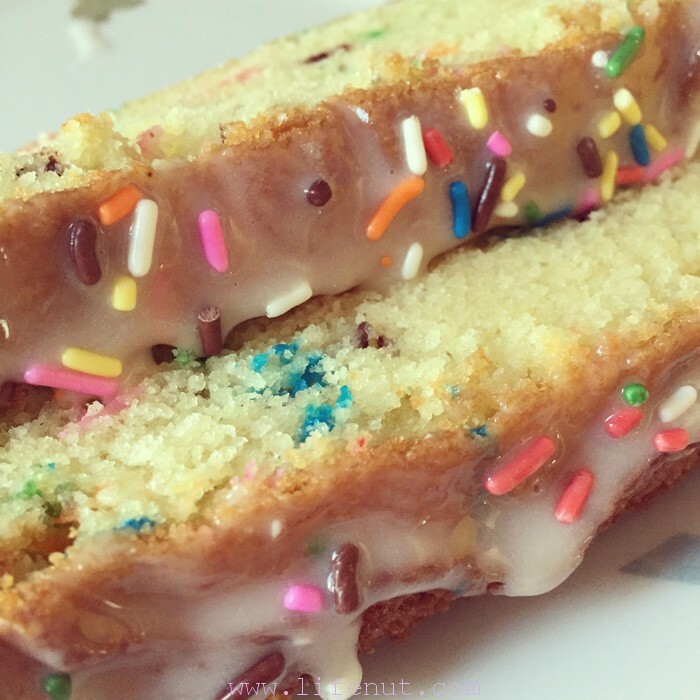 Sugar Cookie Bread is a winner. I can NOT wait to try this – it sounds delicious!